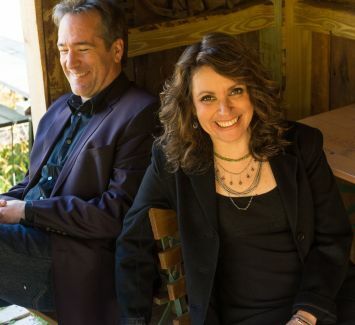 As solo artists, Lucy Kaplansky and Richard Shindell have been making critically acclaimed albums since the early 1990s, and each have contributed harmonies to every one of those albums. But with the exception of 1998’s one-off Cry Cry Cry album with Dar Williams, the two songwriters have never made an album together - that is, until now. And it’s been worth the wait. As The Pine Hill Project, Lucy and Richard have released Tomorrow You're Going, (Signature Sounds), an Americana masterwork produced by multi-instrumentalist and two-time Grammy Award winner Larry Campbell. Tomorrow You’re Going is an evocative, sometimes rollicking, deeply moving collection of 11 songs from writers as diverse as Greg Brown (“Lately”), Nick Lowe (“I Live on a Battlefield”), even U2 (“Sweetest Thing”), and Elizabeth Ziman ("Open Book"). There’s also the lovely, wistful country twang they bring to Little Feat's “Missing You”, and Porter Wagoner & Dolly Parton's "Making Plans” from which the album’s title is culled. Pine Hill Project is an opportunity to see Kaplansky and Schindell revisit the chemistry that made Cry Cry Cry’s self titled album a modern folk classic.